The recent shooting of Florida teen Trayvon Martin by a community member, an unprecedented incident in the history of Neighborhood Watch, has prompted questions about the role neighborhood crime prevention groups play in today's society and, some legal experts fear, could lead to a decline in volunteerism, with neighborhood, homeowners’, and property management associations reluctant to support crime watch activities due to liability concerns. Such a scenario is disturbing because when neighborhood involvement wanes, crime almost always spikes. Fortunately, by taking appropriate measures, associations can reduce their risk of becoming the targets of litigation and, at the same time, strengthen their crime prevention capacities. Call it "covering all bases" or "dotting the I's and crossing the T's" the concept of due diligence is the basis for many legal arguments, both civil and criminal. As defined by Merriam-Webster, "due diligence" is 1) the care that a reasonable person exercises to avoid harm to other persons or their property, and 2) research and analysis of a company or organization done in preparation for a business transaction. For crime watch organizations, this term means establishing and following procedures to ensure that all members understand the group's mission and can safely and effectively carry out their duties. The key to ensuring compliance is clear, ongoing communication, both within the organization and with the law enforcement and legal experts who represent the group's interests. One of the most important relationships a new crime watch group will ever establish is with the law enforcement agency(ies) serving its jurisdiction. Once a new group forms, its leaders are encouraged to invite a crime prevention officer to an upcoming meeting, during which he or she can help the group assess its neighborhood's problems and needs as well as develop standard operating procedures (SOP) for their watch group.3 The officer should also explain the delineation between the roles played by crime watch members and by sworn law enforcement personnel, emphasizing the agency's reliance on volunteers to look out for and report criminal activity—but never confront suspects—so that officers or deputies may respond appropriately. In legal disputes, the ability to demonstrate that SOPs do exist; that crime watch volunteers understand their duties to observe and report; and, most importantly, that the procedures were followed, precisely—is invaluable. "You need to show what reasonable steps you took to avoid problems" explained Donna DiMaggio Berger, Esq., association law expert and managing partner of Katzman Garfinkel & Berger. "Each association needs to talk to an attorney and ask what protocol it needs. At a minimum, [the policy document] should state the function of the watch, what volunteers are allowed to do, and the steps to follow when a member sees possible criminal activity. Have all volunteers sign off on it" Berger suggests asking the local police or sheriff's office if they have an existing manual that can be used as a template. While it can be helpful to have some basic written policies for your watch group, there is no substitute for having ongoing dialogue and collaboration with local law enforcement. According to the USAonWatch-Neighborhood Watch Implementation Manual, law enforcement liaisons "often train Neighborhood Watch leaders, block captains, and volunteers in areas ranging from setting goals to how to report suspicious activities" and "should also be involved in facilitating communitywide Neighborhood Watch activities.”4 Periodic training affords volunteers the opportunity to refine their observation and reporting skills and better understand how their role complements—but does not supersede—that of law enforcement. "It is important for every public safety agency to educate and train its watch groups on how and what to report. Watch group members should never attempt to take on the role of law enforcement" explained Chris Tutko, USAonWatch-National Neighborhood Watch Program Director. "The core purpose of watch groups is only to observe and report to law enforcement. At no time should members intervene when a crime is in progress." Ongoing activities of the Richland County, South Carolina, Sheriff's Department, the 2012 Neighborhood Watch Award recipient, illustrate the importance of forming a strong bond between the crime prevention volunteers and sponsoring law enforcement agency. "Crime watch groups are essentially the eyes and ears of Richland County, and they help us build countless leads, solve crimes, and keep the county safe throughout" Lieutenant Rafael Gonzalez said. Gonzalez described how the agency's Community Action Team (CAT) helps its 275-plus Neighborhood Watch group members sharpen their crime prevention skills. "CAT members go to community meetings and teach/educate the public on how to call in a suspicious person or vehicle. We take them step-by-step through the do's and don'ts of calling in an emergency" He relates the story of a local woman who, upon noticing that two individuals were attempting to break into her neighbor's car, immediately called 911, calmly described the perpetrators, and provided operators with the suspects' vehicle tag number. Using this information, sheriff's deputies were able to locate and apprehend the suspects just a few blocks away. "This example is one of many in which the citizen did her job! She went out of her way and wrote to Sheriff [Leon] Lott, thanking him, the department, and the CAT team member for making her a better witness.... She also stated that if it wasn't for the information she received from the CAT representative at the community meeting, she wouldn't have done what she did." The opportunities for neighborhood associations and crime prevention groups to interact and share time-critical information with law enforcement are increasing thanks to the popularity of social media. "Through Facebook, we can do the same things we do at our meetings—give out crime trends, educate, and make the general public aware of what is happening in their neighborhoods" Gonzalez said. His agency has introduced the Guardian Watch application "Crime Watch in a Pocket" which users can download to their Smartphones. "The idea is to give citizens another tool to help combat crime by being able to take a picture of anything suspicious." Both new and re-established crime watch groups are encouraged to register their program with USAonWatch. In addition to receiving an "Action Pack" for building a watch group, conducting meetings, and organizing training, registered groups also receive event announcements and newsletters through which they can share information with crime prevention counterparts nationwide. "Our database creates connections between all levels of public safety and government" said Tutko. "Registering sends a message to your local public safety agencies that your community is serious about taking steps to improve your neighborhood. It allows groups to be a part of a national movement and know they are not alone—to stand up and be counted and noticed as a group." The Trayvon Martin tragedy underscores the complexity of our legal system, and, more specifically, homeowners' association law. According to current media reports, in addition to the criminal charges filed against the shooter, the victim's family has filed a civil suit against the community association where the incident took place. In response, the association's insurance provider has countersued, claiming it is not liable for damages due to clauses in the association's policy. Taking the time to conduct proper research and consult an attorney, well-versed in both state and federal insurance regulatory policies, can help associations avoid such legal turmoil. While specific coverage varies from one provider to another, most associations' master insurance policies cover only physical structures shared by all residents (e.g., lobbies, retaining walls) against lawsuits resulting from injury or death due to structural malfunction. Typically injuries or deaths caused by the actions of an association member, affiliated volunteer, or resident are not covered in master insurance policies. In addition to the master policy, many associations carry directors and officers (D&O) liability coverage, which provides financial protection if the forenamed members are sued in conjunction with their official board duties. However, Berger warns, without a specific policy rider, the association may not be protected in cases of wrongful acts committed by other members, including watch volunteers. "If your community has volunteers, you need to know what those folks are doing and you need to speak to your insurance agent to ensure that there is coverage in place should something go wrong." A committed attorney is an invaluable asset that no neighborhood association or crime prevention group should be without. The process of hiring qualified legal counsel can be challenging, especially for inexperienced groups and groups with limited financial resources. It is best to begin the process by conducting thorough, methodical research prior to interviewing candidates. One excellent source for information is the Community Associations Institute guidebook, Community Association Legal Counsel: How to Select and Use an Attorney,5 which advises association board members to first meet, to identify the group's current and projected future legal needs and then prepare a written list or request for proposal for potential interviewee response. Colleagues within the property management community are another good source for attorney referrals, but, to further narrow the interviewee list, Berger recommends flagging firms that specialize in, and have at least five years of professional experience in, community association law. During the interview, she also suggests specifically asking what percentage of the candidate's practice is devoted to representing community associations (versus general real estate law). The interview process allows neighborhood association board members to get a feel for a candidate's personality and communication style. For example, the interview committee might note whether conversations and correspondence are filled with complex, difficult-to-understand legal terminology or if the candidate takes time to interpret and articulate legal concepts in layman terminology. "It doesn't matter if your attorney graduated from Harvard, if no one can understand the advice he or she is rendering" Berger noted in her blog, "Condo and HOA Law.”6 She advises neighborhood associations to review each candidate's written communications, as well as request samples of the firm's opinion letters and peruse its website and blog. Other points Berger recommends that interviewers consider include whether the law firm has a history of disciplinary action with the state bar, its track record in homeowners' association litigation cases, and its reputation within the legal community. Asking what billing and payment options the firm offers may also help neighborhood groups, especially those with limited funds, to budget accordingly. If contracting with a law firm on a retainer fee basis, it is always important for the association board to be clear on what services are included in the retainer fee and what services will result in costs being charged above the retainer fee. 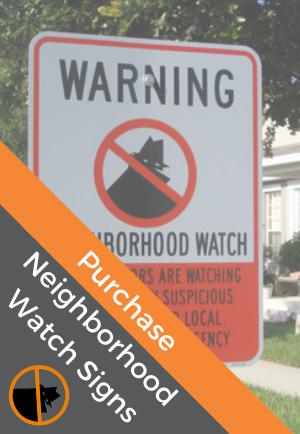 Since the National Neighborhood Watch Program was established in 1972, countless wrongdoers have been brought to justice and crimes prevented thanks to watchful volunteers who are dedicated to keeping their communities safe by observing and reporting illegal activities to law enforcement. Ultimately, by following the guidelines included in the Neighborhood Watch Manual, providing appropriate volunteer training on a regular basis, and engaging in frequent two-way communication with law enforcement, crime watch groups will continue to help law enforcement agencies improve community safety and security by serving as the eyes and ears of the community. National Sheriffs' Association, "The Role of Neighborhood Watch Programs," press release, July 27, 2012. Holloway, Katy, Trevor Bennett, and David P. Farrington. Crime Prevention Research Review No. 3: Does Neighborhood Watch Reduce Crime? Washington DC: U.S. Department of Justice Office of Community Oriented Policing Services, 2008. Neighborhood Watch Manual, National Sheriffs' Association, 2010. Hindman, Esq., Thomas J. and Loura K. Sanchez, Esq., 2nd Ed. Alexandria, VA: Community Assocations Press, 2002. "How to pick a legal professional that is the right fit for your community," October 25, 2011. “Shooting Focuses Attention on Program That Seeks to Avoid Guns"